Station Rd, Castle Cary, Somerset BA7 7PF. The Brook House Inn and Touring Park is in glorious rural Somerset, close to the ancient market towns of Castle Cary and Shepton Mallet, just a few miles from the A303 and 'down the road' from the Bath and West Showground. 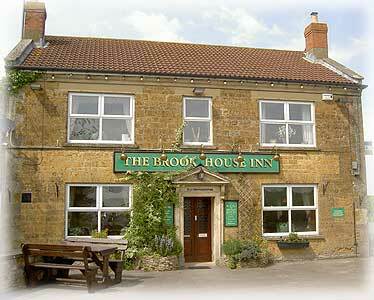 From historical records found there has been a "Brook House Inn" on this site since 1855. This lovely landmark Inn is open 7 days a week & offers a full food menu Monday - Saturday lunchtimes and evenings + Sunday roast on Sundays between 12 noon and 6pm. It also has a large skittle alley and function room with its own bar facility and is ideal for parties, gatherings, meetings, weddings, groups or clubs. There is also a large beer garden with a children's play area at the rear of the pub. For Touring Caravans, Motorhome and tent owners we are a brilliant stopover for those going 'West' or 'East' on the A303, also for those visiting shows in the Bath and West Showground. Bath, Bristol, Castle Cary, Frome, Glastonbury, Longleat, Shepton Mallet, Wells and Yeovil are not far away; Castle Cary railway station is just 5 minutes walk up the road & is on the main Paddington > Cornwall route. We offer full facilities for up to 22 caravans, motorhomes or tents with electrics and elsan disposal as well as 4 shower and toilet wet rooms offering free showers. Weather permitting the Touring Park is open all year. The Brook House Inn is in a rural location and surrounded by dairy farms that have cheese making plants and shops open to the public. Fabulous when you can just pull in and relax and visit the pub a few yards away for drinks and good food!! We now have a new food menu. Our touring rates are excellent value for money so just give us a call to book an overnight stay, a weekend or for a few days. Just call Lynn on 01963 350188 (between 10am - 10pm). We are able to cater for all numbers and tastes in our catering ranging from buffet menu's to full 3 course lunches and will be pleased to discuss your requirements - please call us on 01963 350188 or 07950 964255, we will be pleased to help. "The Brook House Inn......arrive as guests......leave as friends"
Please Note: The Inn is closed Sunday evenings from 6pm. (this is dependant on the amount of guests 'on site'). FrOM 8th January to 19TH March 2018 THE PUB WILL BE closed on mondays, UNLESS THERE ARE PRE BOOKED EVENING FUNCTIONS.